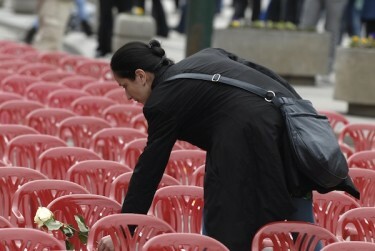 A red plastic chair for each person killed in Sarajevo in the war that began 20 years ago. A whole street lined up with red chairs, all empty but for some flowers on some of them. Those who could have sat in these chairs - 11,541 people - are long gone. 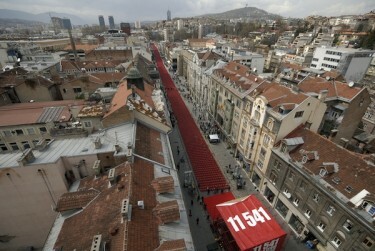 On April 6, thousands of people came to this stunning makeshift memorial stretching along Sarajevo's main street, in order to honor the memory of the victims of the Siege of Sarajevo, which lasted from April 5, 1992, to February 29, 1996 (some of the photos of the memorial are here, here, and here). [...] I don’t have any of my pictures from the 92-95 anymore. I shot many – mostly of dead people, of destruction. Very few had any life in them. Then, just as killings stopped and a different war continued in November 1995 I abandoned my photos; I didn’t want to have them anymore. All that intensity we put into our work and all that commitment to document the horrors and the bravery, the big stories and the small, are way behind us now. [...] But for one blustery April weekend in 2012, a few of us gathered together and remembered what we shared, what we covered, how we lived, and how we tried to help--in that limited way that each of us could.